Find your campaign on the Campaigns page, and click the Send button underneath the thumbnail. Note: If you're sending directly from the Composer, just click the Continue button in the bottom right corner of the composer page. Send to individuals field: If you want to send a test to just yourself, or a few folks who aren't collected in a list, just type them here. This field is optional. Second Send... This is optional. 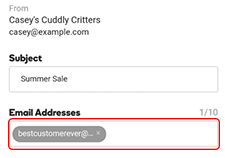 If you select this option, your email will automatically send again, in 72 hours, to anyone who did not open the first email, using the secondary subject line you enter. Don't send this to people who already received it This is optional. If you select this option, people who have received this campaign before, will not be sent this email. Read more about this option. Enable link tracking Make sure this is selected. This allows GoDaddy Email Marketing to report back to you the details of what happened with your emails. Usually you don't want to turn this off, since you won't receive any statistics reporting if link tracking is disabled. Read more about mailing statistics, here. Click the Send button when everything looks good. But don't worry! Your campaign will not send, yet -- you have another chance to confirm all the details. Once you're logged into your Email Marketing account, locate the campaign you want to resend. Learn all about the email marketing stats you can use to analyze your mailings.